Available in both light Oak and Cherry, this vanity table and stool set is a charming pairing to outfit your home. Rectangular in shape, the vanity table is lifted on four curvaceous legs and features one center drawer for convenient storage, as well as an oval tilting mirror. The accompanying stool has matching curved legs with a floral accented upholstered seat. Place in your bedroom or master bedroom to make getting up and ready easy, convenient, and fun. 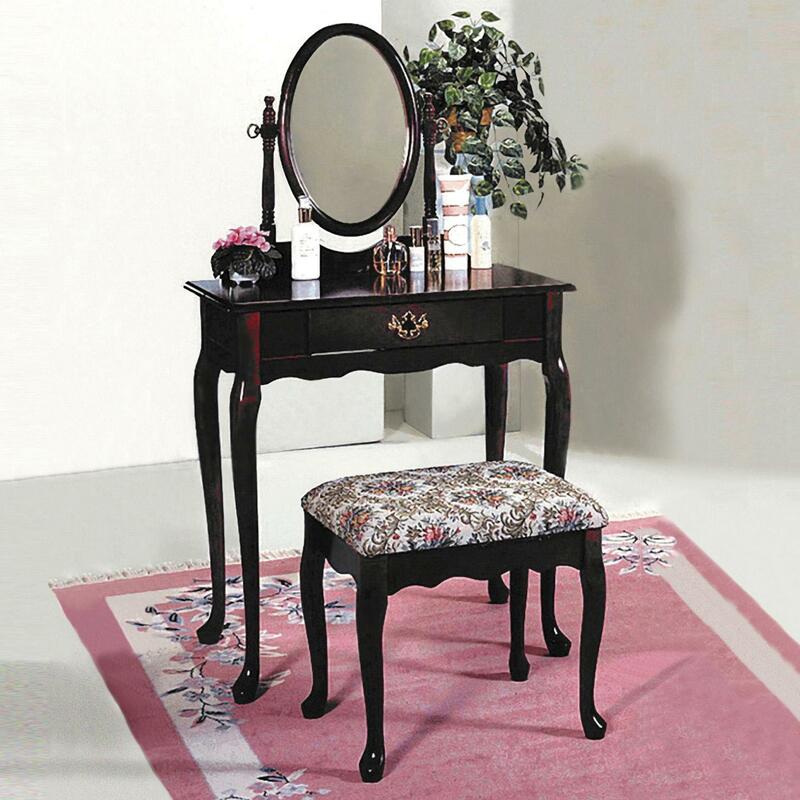 The 2200 Rectangular Vanity Table & Matching Upholstered Stool by Crown Mark at Rooms for Less in the Columbus, Reynoldsburg, Upper Arlington, Westerville Ohio area. Product availability may vary. Contact us for the most current availability on this product. Finish & Paint Options Features a dark Cherry or light Oak finish. Handles & Hardware Knocker style handle pull hardware. Case Detail Curved legs. Traditional edges. Storage Features one center drawer. Description: Top Solid finished tops. Case Construction Crafted from wood veneers and solids, with knocker handle pull hardware, and curved cabriole legs. Complete your living and entertaining area with this occasional grouping. Featuring a matching assortment of occasional pieces, including end tables, a coffee table, and sofa table, this set offers plentiful table space to decorate your home. The vanity and upholstered stool options in this collection add a stylish and functional space to get ready in your home. Available in both a dark Cherry and light Oak finish, these pieces offer a traditional and classic design for your home. The 2200 collection is a great option if you are looking for Traditional furniture in the Columbus, Reynoldsburg, Upper Arlington, Westerville Ohio area.